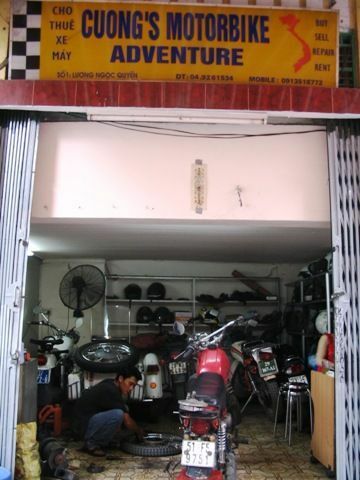 The best and most reliable Minsk rental in Hanoi is Cuong’s Motorbike Adventure. They are conveniently located at 1 Pho luong Ngoc Quyen (about 300m north of Hoan Kiem Lake). For the exact location on the map, check the Old Quarter map in your Lonely Planet Vietnam . Their contact numbers are 04.9261534 (shop) and 0913518772 (mobile). Alternatively, you can reach them at their email address [email protected] Cuong and his staffs speak excellent English. Update July 2010: Looks like Cuong’s website is up! Cuong has a fleet of Russian Minsk motorcycles. The Minsk is a two-stroked motorcycle and requires mixing of 2T oil with petrol. Petrol kiosks attendants will know what to do with your Minsk, but just bear in mind that they should mix around 500ml of oil for every 10litre of petrol. The motorcycle does not comes with an electronic start, so you should be adept at kick-starting the motorcycle. The solid suspension and tractive tires of the Minsk make it suitable for the Northwest mountain roads. Its popularity in the mountain areas also makes it easier to find mechanics should you meet with any bike problems. As a deposit, Cuong requires your passport. When you get back from your trip, he will return you the passport and you pay up. This is the standard procedures for most motorbike rental companies in South-East Asia. If you want to leave cash in place of your passport, the amount is usually the price of the motorbike. This entry was posted in Motorcycle Adventure Vacations, Vietnam and tagged Adventure travel, Cuong, Hanoi, Minsk, Motorcycle, Motorcycle rental by atticus. Bookmark the permalink. Can I rent a Minsk for 4 days so that I can travel alone? You definitely can. Of course, I am assuming you have riding experience and are prepared for the trip. i only drove small motorbikes before (scooter) – would you say it is hard to drive a minsk? Are your scooters automatic? It would be better to have some experience with manual bikes. From what I understand, most of the Minsks are quite old and some riders might find it hard to engage the gears. You should also be adept at kick-starts. Hey, sounds great. But I here you need to leave your passport at various hotels you stay at. how does this work if you leave it with the rental agency? Atticus, thanks for this website. This inspired me to do the same loop back in Nov. 08 and it was the highlight of my trip. A few additional tips: 1) Road construction between Hanoi and Lao Cai is everywhere and greatly slows travel time, and increases dust. this is the toughest part of the trip, 2) It’s not necessary to have riding experience (I didn’t have any) but you should understand manual shifting and local driving etiquette before getting on the road, 3) Getting around is tough because of poor signage and incomplete maps– I wasted a lot of time taking wrong turns and struggling through a language barrier to get back on track… no problem if you have the right attitude as it’s all part of the experience 4) I only had 7 days which is really not enough to do the whole loop. I spent 1.5 days in Bac Ha for their legendary Sunday market and a further north trip to Sima Cai (don’t listen to the guidebooks, there is no military presence there). 5) budget at least 2 full days in Sa Pa so you can ride the mountain paths to all the minority villages tucked away in the hills, 6) You can put your bike on the train back from Lao Cai to Hanoi. This lets you do 1/2 of the loop. Just remember that only the hard sleepers will take your bike on the night train. 7) Be friendly to locals, most of them enjoy greeting foreigners, especially the kids. Respect the hill tribe people by not taking their picture without permission. 8) Bring a camera since the scenery is spectacular. 9) Guest houses (or Nha Nghi’s) are cheap, available in every town without reservation, and will accept a passport photocopy as ID, 10) I recommend the Green Mountain Hotel in Sa Pa, for $10/ night it has the best view in town, though it’s not suitable for winter as there is no heating! 11) I saw three or four accidents in 6 days of riding… just get health insurance, drive slow and expect a few close calls! If I can do it, anyone can! Glad you enjoyed your trip and thanks for sharing your experience. Feel free to post a link to your blog if you have one! I forgot to mention that I also used Cuong’s shop. He gave me a Honda for $10/day which i think is the way to go unless you’re a really good handyman (you’ll probably need to be one for the Minsk). Was it a scrambler? I wonder if they still allow us to rent the bike from Hanoi and return it at Saigon. I still haven’t visited central Vietnam. Honestly I can’t remember the name, I just know it was a 125cc scooter-like bike, but it was beefier than your typical scooter. Yes, Cuong still does the deal where you rent a bike in Hanoi and drop it off with his brother in Saigon. I got a taste of central Vietnam when I flew into Hoi An and then took the bus up to Hue. The scenery is nice but it doesn’t compare w/the Northwest loop. You can rent scooters in Hoi An for $3/day (which I did) and it was a blast. There are lots of beaches and side trips you can make out of Hoi An, not to mention some of the best food I had the whole trip. is it possible for 2 people to ride on one bike? my gf doesn’t ride. what bike options do i have, if any, for this situation. pls advice. cheers! Yes, it is possible but I am assuming that you know that it’s harder to balance a bike with a pillion. If you are bringing big backpacks along with the ride, it would be a tight squeeze. There are 4 of us looking to rent/buy bikes to ride from Saigon to Hoi An via Dalat and Nha Trang. Any ideas on how we should go about doing this? One concern we have is carrying our backpacks. What is the possibility of strapping them to our bikes, or getting a guide to ride in a car with us. Additionally what time frame should we be looking at to complete this journey? Clearly we’re new to Vietnam and have only introduced to the concept of biking a couple days ago. Sounds amazing. Not sure of the sizes of your backpacks, but if they are not too big, you can strap them to the back of the motorcycle. I would estimate 10 for your journey. But that depends on the duration of your stops at Dalat and Nha Trang and other possible stops you might be making. Try out gt-rider forums, you would probably get better advises. Hi, is it possible to take a rented Minsk from Vietnam for a week to Laos (and maybe Cambodia) and than back to Vietnam? Guess there will be problems at the border? Since you usually have to leave your passport to the rental shop, you would definitely have a problem at the borders. There are three of us (me included) keen on biking it from Hanoi >> Halong >> HCMC >> Rach Gia. Need some advice on if we can buy a motorcycle\scooter in Hanoi and hire a guide for the first leg to Halong then self-guided from there onwards. Want to buy as not sure if we want to leave our passports in Hanoi since we won’t be returning there, we could always sell in HCMC, I have relatives who I can leave the motorcycles with to sell. I got Coung’s and Voyage Vietname as 2 possibilites for renting, do they also sell? Can you recommend any other reputable outfits in Hanoi? I have seen foreigners buying bikes and selling them at the end of their trips. Not too sure if it’s legal but it’s being done. Hiring a guide for your purpose is definitely possible with a suitable amount of incentives. An alternative you can consider is renting a bike from Cuong at Hanoi and dropping them off at Ho Chi Minh. Give him a call or email to confirm if they still provide such an arrangement. You should able to get better advices over at GT-rider or Horizon Unlimited forums. Thanks Atticus, looks like my group is pretty set on buying if we can, I have emailed Cuong and he has been really helpful, hopefully we can do some business through him….keep you posted. Yep, do share with us the logistics of buying a bike. If I have a chance, I would also like to do a ride from Hanoi to Ho Chi Minh. hey, if you need info on buying bikes contact me. i live in hanoi, i have plenty of minsks that are perfect and well fitted with after market parts, look nothing like what you have seen before! Hey!am Planing in Buying a Minsk in cambodia and doing a cambodia Vietnam Tour!will i Be Allowed over borders without problems?i have the Vietnamese papers….. It is better if you check for the details in gt-rider forums. I’m planning on a month-long trip from Ho Chi Minh up to Hanoi. I’d really like to do it by motorbike- do you know of anywhere that would allow me to pick up in Ho Chi Minh and drop it off in Hanoi? Does Cuong ever allow the opposite? 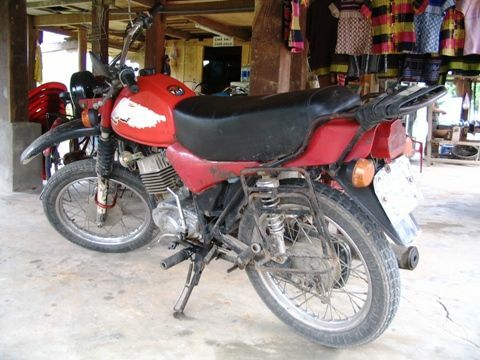 Or would you suggest buying a motorbike instead and attempting to sell it afterwards? Also… would you say that the trip would be too dangerous for a woman to do alone? From my last check with Cuong, they do allow picking a bike from HCM and dropping it off in Hanoi. Best for you to confirm with them. I have also seen people buying motorbikes in HCM and selling it off at Hanoi. I don’t really like the hassle so I prefer to rent. I am not sure of your riding and traveling experience but things do happen. If you are someone close to me, I would definitely be worried for you to be riding alone. One question: once we arrive in Sapa we do not intend on returning to Hanoi, but crossing over in to Laos and sending the bikes back to Hanoi on the train unaccompanied. Is this possible? You have to check with the rental company if they can do such arrangements for you. Either they have contacts in Sapa or you hire their guides to travel with you to Sapa so there are somebody to take over the bikes. I guess you can probably work something out if you are willing to pay.